thing! A few of our favorites to go with it is cinnamon french toast and scones. YUMMY and it's so easy! I hope you enjoy it as much as we do! Melt butter in pot. Add sugar. Add buttermilk. Bring to a boil for 1-2 minutes. Remove from heat. Add vanilla. Add baking soda. Hello! Hope everyone had a wonderful weekend! I just wanted to share my latest project. Let me just start by saying that I am not a seamstress. I took sewing in high school and loved it, but other than that I really have no idea what I'm doing and I just do it as I go and try to teach myself how to sew. Please please please share any advise that you have! I hope this makes sense. I'm a beginning sewer so if you have any questions please let me know. Here it goes! Enjoy! 6. Lay green fabric facing right side up. Lay brown fabric on top of the bottom of the green fabric (folded edge of brown fabric toward the top of the dress) and pin the edges together. This is the full view. Green fabric is facing right side up. The top is folded under 3in and pinned (top of dress). The bottom has the folded brown fabric on top (fold facing toward the top) and edges pinned together. Left side: inside of dress. Right side: out side of dress. 8. Now the brown folded edge will hang down being the bottom of the dress. Run another straight stitch over the seam you just did. This will keep it from moving around. Sorry this picture is blurry! Left side: inside of dress. Right side: out side of dress. 9. Straight stitch the top folded portion of the green fabric. Then 1 1/2 in down from top of folded edge. Straight stitch entire length. Now you will have a pocket to insert the elastic. 11. Insert elastic using a safety pin. 12. Sew the elastic edges together. Sew the pocket edges together so you can't see the elastic. 13. Attach buttons to front and you're done! So my baby is not such a baby anymore...she just turned one. And yes I'm still working on decorating her room. Why you ask? Because I had a huge flop when it came to painting her room. When choosing a color for her room before she was born I really wanted to do something really girly. My hubby on the other hand wanted to do a neutral color that would go for a boy or girl (can you tell that he really wants a boy next). He talked me into a fun bright green only it looked horrible with our nursery furniture. I got the entire room painted green, moved the furniture in and I hated it. I wanted so bad to like it and fully decorated it two different times in hopes that I would like it. It didn't work. So after a year of living with the horrible green that I absolutely hated I got the energy to paint it again. I decided to do a tan on the bottom half and purple on the top with a rail all the way around the room. This way if we do have a boy next I'll only have to paint the top. I absolutely love how it turned out and no longer cringe when I go into the room. Don't mind the empty walls...it's still a work in progress and I haven't quite decide what I'm going to do with the rest of it. Enjoy! *Check back for my painting techniques and tidbits. Within the next week I'll be starting my master bedroom and will take pictures as I go so it's easier to explain. Roll cardstock into cone shape and glue. The top will not be a circle you will need to cut around so it is a circle. Don't worry if it's not perfect the boa will cover it. Next punch 2 holes across from each other to attach tulle. This will be how you hang your cone. Thread tulle (or ribbon) through each hole and tie a double knot to secure it. Don't pull the knots tight. I also left a tail of tulle on each side. Next add your accessories. We used feather boas around the top and some used them around the bottom. We put the girls initials on them and some have princess tiara's and of course some bling! Prime with KILZ spray primer. The best primer in the world! Make sure you have and even coat and everything will be smooth sailing! Spray paint. I used Krylon Blue Ocean Breeze and I applied a couple coats. Add glaze to your desired look. I think it turned out beautifully and I love the color! I'm still working on my master bedroom so you'll see full room pictures when I do that big reveal. I'd love to hear from you so please leave a comment and click to follow me. Thanks for stopping by! I'M SOOOO EXCITED RIGHT NOW! I linked my dresser makeover to a few parties last week (my first time ever) and I was featured at Tales From Bloggeritaville and I was chosen as the #1 project by my idol and lady that introduced me to the world of craft blogging Ms. Mandi Gubler from Vintage Revivals who was a guest judge at The CSI Project. If you haven't checked out Vintage Revivals you need to! Mandi is fabulous! I just wanted to share my excitement! Thanks for stopping by and please come follow me and leave comments. It'll be nice to know if anyone is reading this or if I'm talking to myself. Put diaper around wreath form and secure with elastic. Continue all the way around. I alternated the pattern doing one diaper facing forward then the next facing backward and so on. Add accessories. I thought of this after the fact and stuck in the spoons because it was what I had on hand. Think how cute it would be with baby toys or shoes and hats. Oh the possibilities! I think it turned out super cute and not a lot of people have done it! I hope you enjoy! OK everyone so I am not a cook by any means. You would die if you knew what my husband and I ate when we were first married! Let's just say that frozen fish sticks and tater tots were a common meal. It makes me cringe just thinking about it! Anyways, cooking for me is creating in the kitchen. I started to like cooking and got more into it and brave enough to try it about four years ago. My favorite thing was to watch Rachel Ray's 30 minute meals. It really helped me to see how she did things and I learned what some new things were. I like easy recipes, but I like them fresh and I like to know what's in it. With young and growing kids I also want to make sure that I'm offering the things that are really healthy for them and will teach them good eating habits not only at meal times, but also at snack time. Now I'm not a crazy no sugar fanatic. I like my cookies and chocolate, but I've always been a pretty healthy eater and I know that it's important to put healthy good foods into your body. Here's one of my family's favorite meals. It's super simple and probably everyone already has the recipe, but I'm putting it in here for a reference place for my family if we ever needed it. I hope you enjoy! Mix all ingredients in bowl. Fill tortillas and roll in baking dish. Bake at 350 degrees for 30 minutes. First I used Kilz spray primer and made sure I had an even coat over the entire dresser. I've tried a few different brands of primer and Kilz is by far the best. Then I used Krylon Glossy White spray paint and this took a couple coats (make sure to let each coat dry completely before applying the next coat). A glossy paint finish is easier to clean so I prefer to use that over any other finish. After the paint is completely dry I applied the glaze. I used Behr faux glaze tinted with black paint. There is so much detail on the drawers of the dresser and the glaze really makes it stand out. When applying glaze I use a foam brush and barely dip the tip in the glaze (a little goes a long way) apply it in the crease and then wipe with a damp wash cloth. Then I used Rustoleum Hammered Oil Rubbed Bronze for the hardware. And that's it! It took a day to complete and we couldn't be happier to finally after 2 years have a dresser that fits in our bedroom and is beautiful! Enjoy! 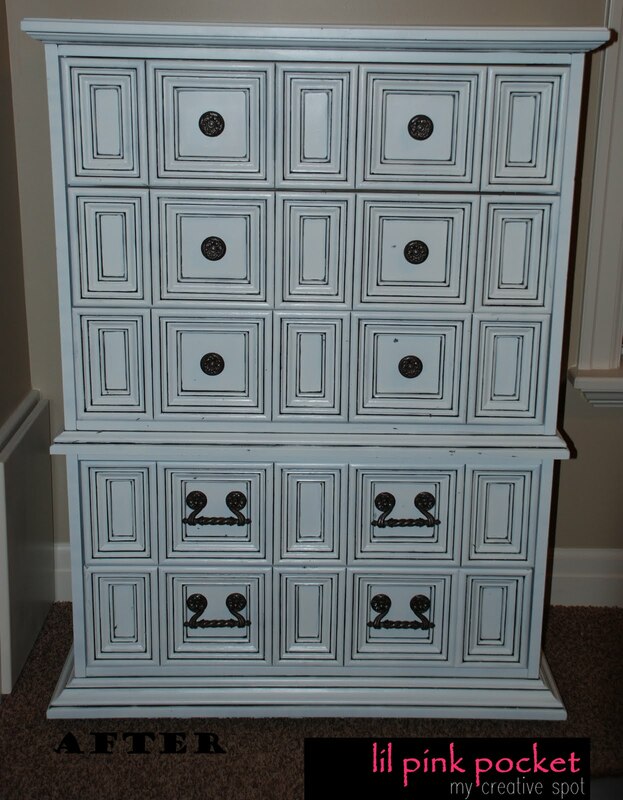 I've been working on our master bedroom furniture and had to share what I've done so far. Our master bedroom has always been the neglected room when it comes to decorating. 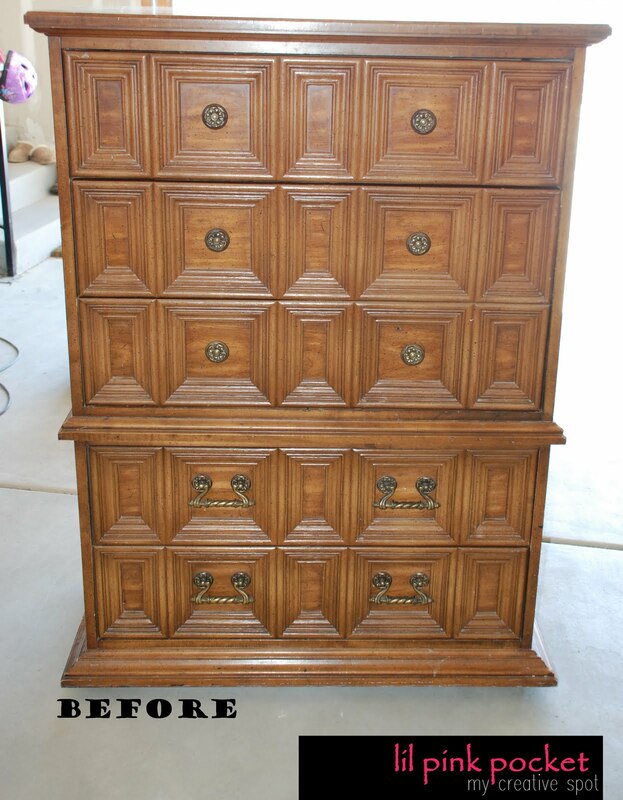 For the past 2 years we've lived with a dresser that didn't fit and was in front of the window and wrought iron and glass furniture that only stayed looking nice and clean for 5 seconds and my hubby hated it, but it was free so we lived with it. With my new thrifty skills that I've been learning from one of my favorite blogs to follow All Things Thrifty it was time for an affordable change and I even made money! Does it get better than that? We sold our old dresser, nightstand and bedroom bench for $190 (we still need to list our headboard). Total spent for our new headboard ($2o on KSL), nightstands ($40 on KSL), dresser ($40 on KSL), Kilz spray primer and Krylon spray paint came to about $140. Gotta love it! Enjoy! Also I'd love to hear from you so please leave a comment and ckick on the side to follow me. *Krylon spray paint used (gloss finish): White and Bauhaus Gold. I'm loving how this is all coming together! The best part is that I had all the sheets, pillows and comforters in storage in the basement. All were used separately throughout our last house. I love that you can split up sets and combine them with others to make something new and fresh! This is the project that I absolutely fell in love with and was inspired to do by Brooke at All Things Thrifty. We've been wanting a bigger table for awhile and thanks to Brooke I now had an affordable way of getting something that I absolutely love! 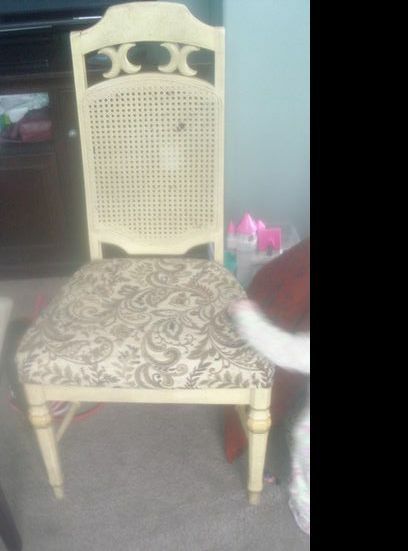 I posted our table on KSL (local classified adds) and sold it in a half hour. I started hunting down and searching for furniture at local thrift stores and classified adds and finally found a table at Savers Thrift Store. It is old and heavy and built to last, but it needed some love. I found my chairs at the D.I. (local thrift store) and on KSL and paid $5 each for most of them. A total steal and after some color and new fabric they are fabulous! Of course that is my biased opinion. Unfortunately just over a month ago my computer crashed and took my external drive with it and I don't have any of my before pictures. I wish you could see the transformation! I am absolutely in love with it! For the table, chairs, fabric, primer, spray paint and glaze (enough to last me a long while) I spent about $160. We sold our old table for $100 so we spent $60 out of pocket and I now have a table that extends to seat 8 comfortably. I'd love to hear from you so please leave a comment and click to follow me. I hope you enjoy! *Krylon spray paint colors (glossy finish): Ivory, Raspberry, Blue Ocean Breeze, Bahama Sea, Pumpkin Orange, Bauhaus Gold and Ivy Leaf. Some fabulous people that my husband works with were able to fix our external drive and we now have all of our pictures! So fabulous for me and what it means for you you ask? You get to see the before pictures of my table! Enjoy! Ok peeps this is the beginning! And when I say peeps I'm not technically talking to anyone cause no one even knows this lil spot exists. Not crazy! Promise! Anyway, I'm super excited to be starting my creative spot, to start documenting my creating journey from successes to failures in decorating, cooking, fashion, crafting and everything in between. I am brand new to the creative crafting blogging world and found Mandi from Vintage Revivals when she was on The Nate Show and from there found Brooke from All Things Thrifty. These two ladies have inspired me and have really given me a much needed kick in the rear to get things going with decorating my house and to not be afraid of the things I really want to do. I've always been a do it yourself kind of girl and I love and have to be thrifty. I love color and love when there is a big statement in whatever you're doing, but I needed some inspiration to really get me going. I also can't forget to mention my friend Lindsay from Southern Lovely that saw my furniture projects on my family blog and gave me encouragement to start my own creative spot/blog. Just as I'm writing this post I starting thinking back on recent events and friendships that have brought me to this point of having the courage to be bold and put myself out there and to bring the color in. My family and I moved into our home about 2 years ago and everything has pretty much stayed bare or has been filled up with miscellaneous decor from our previous home. We've also been going through some very hard financial times from 3 layoffs in 2 years and haven't been able to spend money on new furniture to fit our new space or the fancy things that I fall in love with and that includes everything from fashion to decorating and everything else. I love bright bold colors and to do things that my husband would say are "different." My husband on the other hand likes things plain and what I call "matchy matchy" (is that even a word), but when it came time to decorate my now 3 year old daughters room I just did what I really wanted to do. It's bright and colorful and I LOVE IT! It is still (a year and a half later) a work in progress because as you'll come to realize I'm a multi tasker and a perfectionist and for the most part do multiple projects at once and sometimes I have to wait for the perfect piece of furniture or decor for the right price. Drives my husband crazy, but I have so much going on in my brain I just have to start getting it out! I'll post pics and details of my daughters room in a separate post. 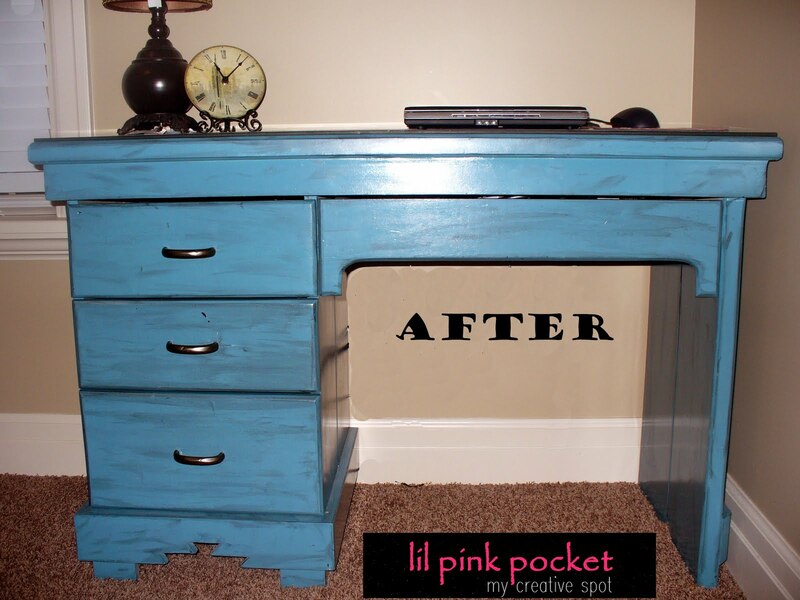 I had done a few furniture re dos (you know when crackling was huge...I had no idea what I was doing, but I redid our awful oak dresser and we had it until just a few months ago...8 years), but I think my daughters room really was the starting point. Then I met my amazingly beautiful friend Jodi that is a fashion diva! I would love love love to have her wardrobe! So of course being around her made me want to have those looks to, but we all know that I can't go out and buy anything so I have to work with what I have. I'm loving the idea of making the old new by revamping and giving it new life by using it in a different way. I'm starting to do this with my clothing and I'll be honest I'm having trouble and would love help, but once in awhile an outfit comes together that I really love. Next, I have found inspiration from the fabulous children's books Fancy Nancy. I absolutely love this little girls outgoing daring way of using accessories and items in unexpected ways like Christmas ornaments as earrings and bows tied around her ankles and making everything fancy! And I love that she's not afraid to be herself and tells it how it really is. I want that for me and to be someone my girls can look up to. This is me taking a step in the direction of pursuing something that I love doing. This is a learning journey. I have no idea where to go from here, but I'm having fun so far! I hope you enjoy your time here and thanks for stopping by!